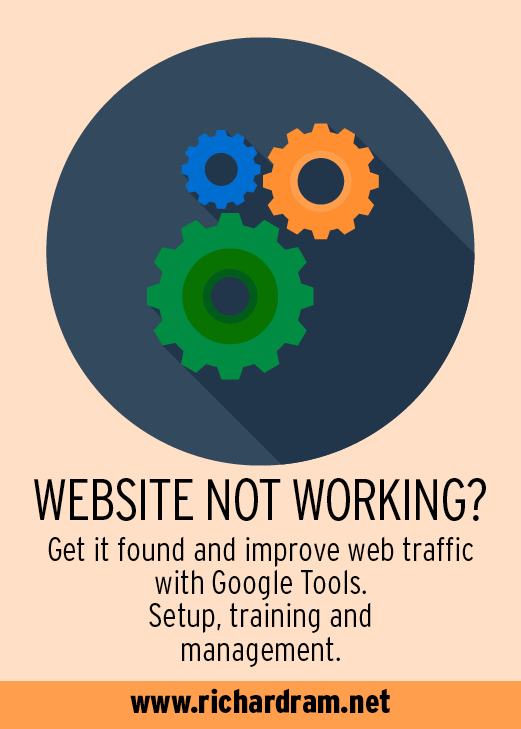 Trendy sports utilities are all the go – here are three more to consider. TRENDS only last so long, right? One day, assuredly, we will have our fill of sports utility wagons. The ways things are going, you’d have to be especially prescient to pick when the tide will finally turn. Some say it’ll come after 2020, when the next round of emissions standards enact in major markets. The greater the challenge of meeting exhaust output targets, the greater the appeal of moving people away from big vehicles with extra weight. Even now, I can understand of some find it hard to understand why we’re so keen. Few SUVs and crossovers are as pleasing to drive as pure cars and even though marketing suggests great adventures are possible, truth is hardly any deliver significant off-road ability. Not that they need to. Most owners never consider putting them to that test anyway. Still, here am I, raising all the reasons why they fail … and yet also having to confess to owning a Subaru Outback. Which I love. Because? It’s roomy, practical and offers good ingress and egress. And while the driving position isn’t that much more commanding from a regular station wagon (which Subaru doesn’t build any more) it’s high enough to empower. Also, I KNOW it’ll provide access all areas, come the day. One day. Anyway, I’m hardly arguing from a minority position. Year to date vehicles categorised as SUVs are accounting for more 41 percent of total new vehicle registrations. One tonne utilities – which, in highest-end formats, are considered SUV substitutes – nabbed another 30 percent of volume. By comparison, sales of traditional cars are dropping, accounting for fewer than one in four sales year to date. In the same period of 2017, cars held a 27.6 percent slice. No wonder distributors are making hay, not least in the compact and medium SUV sectors, which are going gangbusters. This is where you’ll find the three vehicles on test today and listed in price order. Powertrain, punch: 2.0-litre turbo-petrol four, 140kW/320Nm, 7-speed automated dual-clutch transmission, AWD, Combined economy 7.0 litres per 100km, 0-100kmh 7.9 seconds. Dimensions, data: 4363mm long, 1625mm high, 2915mm wheelbase, luggage capacity 485-1579 litres, 18-inch alloy wheels, 225/50 tyres. TO give perspective. This is the mid-sized one. A smaller model, the Arona, has just arrived to sit below. A larger, to meet fully family friendly functionality, lands next year. That’s the Tarraco. Three sister SUVs will potentially provide a solid ongoing sales standing for SEAT, but it’s equally likely that the Ateca – the one that got here first, and was also the first SUV Volkswagen’s Group’s Spanish subsidiary has subscribed to - will maintain as the brand’s single-best seller in the long run. 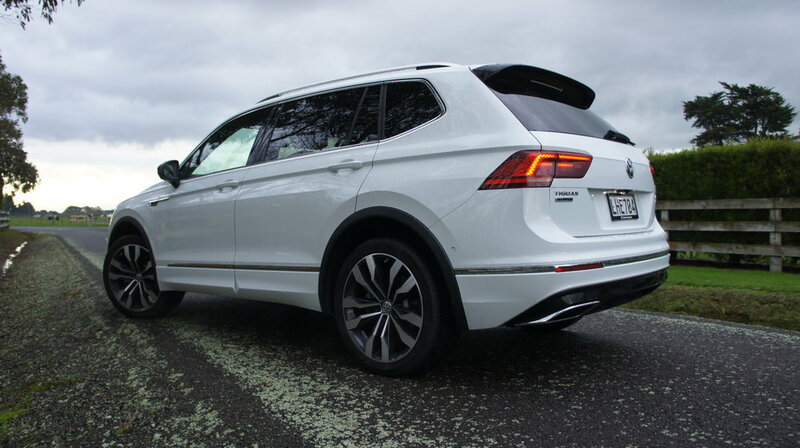 All technology roads with this car ultimately lead back to Wolfsburg, yet if looking for a comparison car within VW-dom, consider less the parent brand’s Tiguan and pay closer attention to a cousin from the Skoda side of the family, the Karoq. Parking them together to compare silhouettes suggests they share almost as much in design as in hardware. Differences in nose and tail sculpting aren’t so obvious in profile as from other angles. Aside from that, the only disparities of note show in respect to the wing mirrors and the C-pillar shapes, SEAT favouring more pronounced angularity. But I swear front doors plucked from one would fit the other. This twinster element carries into the cabin, but to lesser degree because even though the shapes and equipment elementals are close, each brand has been allowed to go its own way for material selection and colour-coding, the SEAT being just a bit more vibrant so as to be true to its marketing promise of being a brand for fun-loving youngsters, in age or at heart. I’ve no problem with any of the above, mind. The Spanish model is perhaps slightly more chic, it and the Karoq and Ateca both stand solidly equal for being decent-looking considerations than, while practical-minded, also deliver above-average flair and flavour for the money being asked. And that aspect is the core common tie between VW’s ‘S’ brands. While clearly mandated with having to work at a lower price level than the German stuff, they nonetheless conspire to present less as ‘budget’ than as ‘value.’ It’s a policy that should deliver rich reward in this small-medium sector, given the intensity of the competition out there. Especially for a new brand. Ateca lands with a trio of engines and specifications, from a 1.4-litre petrol-turbo with front-wheel-drive to a 2.0-litre turbo-petrol with 4Drive and 2.0-litre turbodiesel, in a mixture of Style, Xcellence and FR formats. The $50,900 FR petrol on test here is the second-most expensive yet also top-of-the crop in that it’s more flairful than the pricier Xcellence 4Drive turbo-diesel and potentially more relevant, given how petrol-focussed this sector has become. The pricing puts this variant into competition with a host of others, including not just some of the top-selling Japanese alternates but also the highest-spec Karoq, the $48,490 Style. If you’re looking for the SEAT’s X-factor advantage, don’t compare on interior specification but instead look under the bonnet and also consider on dynamic feel. I’m sure Spain has just as many quiet, bookish types as anywhere else in the world but it’s the typecast hot-blooded Latino image that is brought more to the fore with this car’s character, primarily though it being provisioned with a more potent powerplant than is occasioned in the Karoq and Tiguan. As this 140kW engine is also furnished with a sports package that finesses not just the suspension but also, by the feel of it, the steering, the brakes and the gearshift pattern, it adds up to a car that, while not outright track-ready, is nonetheless a bit more rakish and eager than the familial alternates. Yes, it means that, on coarse chip especially, the ride can sometimes seem too jittery, even when the suspension is dialled back to its softest setting. And, agreed, tyre-generated roar can be an issue from time to time. On the other hand, the FR treatment certainly makes the most of what is a well-sorted chassis. It’s more fun to drive thanks to its grip and deft handling. The suspension when the Drive Profile system is put into Sport format keeps it from leaning too much in corners and builds confidence. The engine has heaps of thrust, an amusing soundtrack and the seven-speed direct shift transmission is extremely well attuned. If you’re looking to loosen the straight-laced sensibilities, then this is a good choice, being right up there with the Mazda CX-5 which, of course, has the same kind of power, similar 0-100kmh takeoff (for the Ateca, that’s a 7.9 seconds job) but is a little less devilish in driving attitude. Play time is further enhanced by a Dynamic Chassis Control for $1750 extra. Being a compact model, with a somewhat car-like driving position, also enhances the Ateca’s imprint as an eager little scamp; obviously, too, the all-wheel-drive ingredient is also rather vital, too. All in all, it’s a car that seems well-attuned to being driven with confidence on secondary winding roads, sealed or gravel. How it might acquit beyond those points was not significantly tested. Those tyres, for a start, are clearly street shoes. Ateca’s size means it’ll be cosy with all seats occupied; on that matter, you’d probably think of it being better-suited to four adults as they’ll be all but rubbing shoulders over the centre rear. The boot is good, but be aware that the 510-litre capacity avails with a front-drive edition. Four-wheel drive reduces capacity to 485 litres. Fans of the latest technology should be happy with the Ateca’s connectivity, which includes Apple CarPlay, Android Auto and MirrorLink, allowing you to access many of your apps on the central eight-inch infotainment touchscreen and via the steering-wheel-mounted controls. It also has keyless entry/start and hands-free tailgate but three features that Karoq buyers enjoy - power adjustment for the front seats, park assist and tyre pressure monitoring – are cost extras with SEAT. Upgrading to leather trim is also another impost, though I’m not sure if it would surpass the Alcantara upholstery’s comfort. Driver-assistance/safety kit includes adaptive cruise control, autonomous emergency braking, blind-spot detection and top-view camera. It scored the full five stars in Euro NCAP crash-testing, with a mightily impressive 93 percent for adult occupant protection. All in all, though, what sells this model is its attitude and special character. It takes some doing to be a standout in a crowded scene - yet Ateca makes it look easy. Powertrain, punch: 2.0-litre biturbo-diesel four, 176kW/500Nm, 7-speed automated dual-clutch transmission (DSG), AWD, Combined economy 6.5 litres per 100km, 0-100kmh 6.7 seconds. Dimensions, data: 4701mm long, 1674mm high, 2787mm wheelbase, luggage capacity 700-1775 litres, 20-inch alloy wheels with 255/40 tyres. WITH the standard five-seater now joined by a seven-chair Allspace, that makes two body styles, but it hardly stops there. Eleven different models now span three trim levels, with a choice of five different engines, with two or four-wheel drive. So, basically, if entering a VW showroom, it’s hardly helpful to simply ask to see ‘the Tiguan.’ Those days are gone. Basically, it’s an entire tribe. So, who’s the big chief? That’ll be the edition here. This R-Line BiTDI version of the Allspace, with marries family-minded practicality with a swish (yet, you’d hope, mucky finger-resistant) specification and a 2.0-litre biturbo-diesel engine. With 176kW/500Nm, the latter is very much a big daddy implementation, given the Tig’s gruntiest compression ignition offer until now been a same-capacity, 140kW/400Nm unit. Well, you need a lot of heft to haul seven bodies, right? Erm, about that. While delivering in a two-three-two triple-row configuration is a strong marketing idea, the reality upon assessing this model is that VW is another of those brands that assumes a perfect occupancy strategy scenario. How often does real life conform to particular sizings: Extra small in the back, no more than modestly medium in the middle, large (but not too much so) up front? If your family situation does, then it’s all-sweet for a future as a kindergarten cart horse and school zone shuttle. For bigger haulage jobs, though, the largest Tiguan yet is not so well suited. Certainly, thoughts of taking some mates for a ride into town for a night out we had planned was gazumped on realisation that even locating the skinniest, shortest adults in the back row, and four more beefier bods in the centre and up front was going to be too challenging for this configuration; head and shoulder room was fine; but knee and foot room rather less so. So, in the end, we took two vehicles. To be fair, plenty of other mid-sized seven seaters are no better configured, but it does reinforce that that this is an extended Tiguan – and could only be stretched so much - rather than a much larger vehicle overall. Yet even though it’s not quite a Biguan, that doesn’t rule out usefulness for fully adult consideration. However, when big bodied types are wholly involved, it’s a far more convenient consideration as a five plus occasional two which, with the rear chairs lowered, provisions a very generously-sized boot. Certainly, it dresses for this scenario. Even though the trim would doubtless sustain abuse from young snots (I was impressed that the fold-out table attached to the rear of the back seat seemed none the worse after a relative sought to stow it without first releasing the latch), the R-Line packaging is patently here to impress big people with fat wallets. The interior ambience is all very top notch, provisioning soft leather upholstery, Comfort-spec seats up front, a 9.2-inch media system with glass-covered front and proximity sensor (so the menus appear as your finger waver over it). As well as ticking off rather impressively on luxury, it also sets out to leverage the ‘sports’ part of SUV, abetting that impressively muscular engine with very decent footwear with Volkswagen's Adaptive Chassis Control adding ability to enhance suspension, steering, throttle and the DSG’s shift responsiveness. It’s neat to think it has something of a GT air, but would you really see it as the best car in which to release your inner (insert name of favourite VW WRC driver here)? I’m not sure I would, given it’s still not only relatively heavy but also is so extended that the handling is less taut than you get with the standard five-seater car; there’s not a lot of body lean but it’ll ultimately squirrel the back end a little in bends. That there’s no need to worry, as the 4Motion transmission maximises traction on the move and adds a sense of security, mightn’t wash with passengers. A real buzz comes from a standing start. The wheels chirping at the upshifts into second and even third reminds how much torque this engine is unloading. So there’s all that. And there’s the Touareg. The new big brother just weeks away from release still doesn't offer seven seats - an odd oversight, you’d have to think. Yet it is bristling with technology, oozing with understated opulence and promising limo-like luxury with a lot more spaciousness, has more power, more towing ability. More of everything. Short of nothing save two chairs. And quite potentially set to price quite closely to what we have here. Surely it won’t be that hard to compel the kids into staying at home and sharpening up their Fortnite skills. Powertrain, punch: 2.0-litre turbo-petrol four, 182kW/350Nm, 8-speed automatic, AWD, Combined economy 7.1 litres per 100km, 0-100kmh 6.5 seconds. Dimensions, data: 4425mm long, 1652mm high, 2702mm wheelbase, luggage capacity 460-901 litres, 20-inch alloy wheels with 245/45 tyres. HERE’S another Volvo that reinforces why being sold off by Ford to an entrepreneurial Chinese car maker was, while sounding like a death knell at the time, has instead been the best thing that ever happened to the Swedish brand. 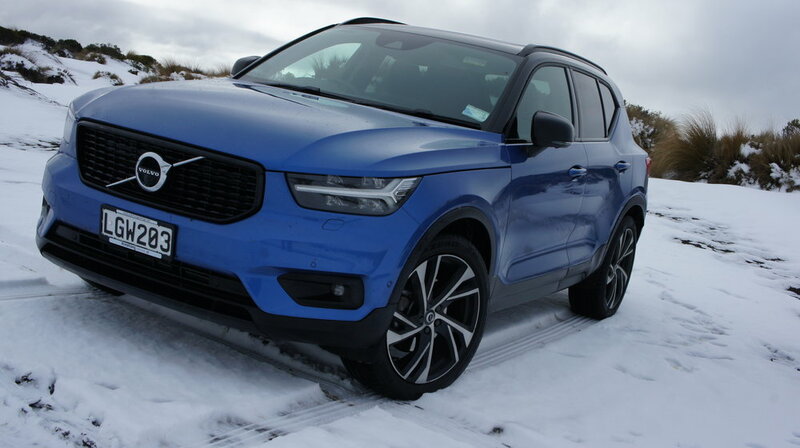 The ownership change is the reason why the XC40, like the XC60 and XC90 before it, is a triumph. Under Blue Oval control, Volvo was forced not just to use Ford technology but also bend to Ford business practice. The cars it produced during that period reflect this; they were solid but stolid, comfy and safe but cautious. Ultimately, they were on a road to nowhere. Under Geely comes freedom to realise engineering (the Scalable Product Architecture platform, for one) and design ideas that were previously but dreams. A huge amount of resourcing and financial assistance comes with no strings attached, save an understanding that Volvo tech will spread into other Geely product, notably its Lynk and Co premium brand. Meantime, Volvo is able to be its own self. The new-found optimism and confidence reflects in the sports utilities; now obviously core cars given the insatiable global desire for such product. 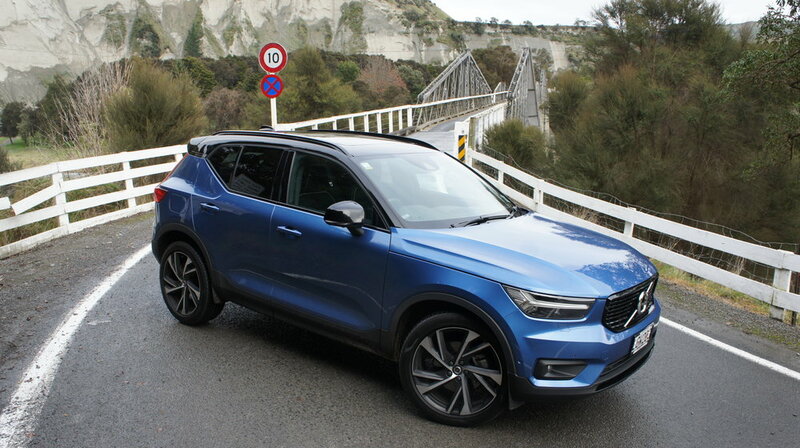 Of that crop, last year’s XC60 and this smaller XC40 are especially crucial, given they push into the premium medium and compact sectors which are running hot. The Forty – aka, ‘tough little robot’ (in lead designer Ian Kettle’s view) – is a whole family, starting at $59,900 and spanning three trim levels, the entry one with front-drive, the mid and upper levels in all-wheel-drive. All with versions of Volvo's 2.0-litre turbo-petrol engine. Further down the road we will get the plug-in hybrid XC40, with a three-cylinder petrol engine and lithium-ion battery pack. First off the boat and driven here is the Launch edition. What you’re seeing is an extra-glammed edition of the regular flagship. The test car was the only Launch car not sold but has already been spoken for. However, Volvo here can easily rig up a regular R-Design to the same spec – though perhaps not the edition’s bespoke ‘Bursting Blue’ – for $81,825, because the main extra feature of the special is that it implements as standard a normally cost-extra Driver Support Pack (adaptive cruise with Pilot Assist, 360-degree camera and automated parking) and Lifestyle Pack (tinted windows, power folding rear seats, panoramic sunroof and Harman Kardon sound system), plus heated front seats and alarm. The Launch’s attraction was that it saved almost $3000 on the cost of optioning the regular R-Design. Serves you right for prevaricating. Or maybe not. Volvo tends to sell to sensible sorts and, while there’s definitely a place for these super-priced special editions, I personally wonder if you could go for some of the less heftily-priced versions and not feel as though you’re losing out. That’s not to say the Launch failed to allure. Quite the contrary; it was great to drive and attracted a lot of favourable kerbside comment. But it also caused a commensurate number of jaws to drop when the price was relayed. Still, premium is premium and the premium reaches of this category is a heavily bejewelled place indeed. And the Launch is clearly that in being kitted to compete with the highest-end editions of the Audi Q3, Mercedes Benz GLA, Jaguar E-Pace and the BMW X3. Or maybe the X2. Dimensionally, the Swede sits between Munich’s models. To get your bearings, it’s also 263mm shorter than the XC60, a car which struck quite a positive chord in previous tests. The medium and small Volvos are not on the same platforms – this car going to a smaller construct that is said to be cheaper than SPA - nor are they quite Russian dolls in shape, but they certainly have a lot of design similarities inside and out. But then, so do all the post-Ford Volvos. And that’s entirely on purpose: This is the brand making the most of an opportunity to truly express itself without restriction. Still, for all the ‘Volvo at 100 paces’ promise of its styling, the idea was to make it look less like a down-sized ‘Sixty’ and ‘Ninety’. Volvo's designers have stuck closely to the concept’s blocky, chunky styling but thrown in even more unique small details (headlight shape, grille, that kicked-up line at the back). It's perhaps a little colour sensitive yet hard not to like. Few Volvos probably sell themselves on looks alone, but this one might. 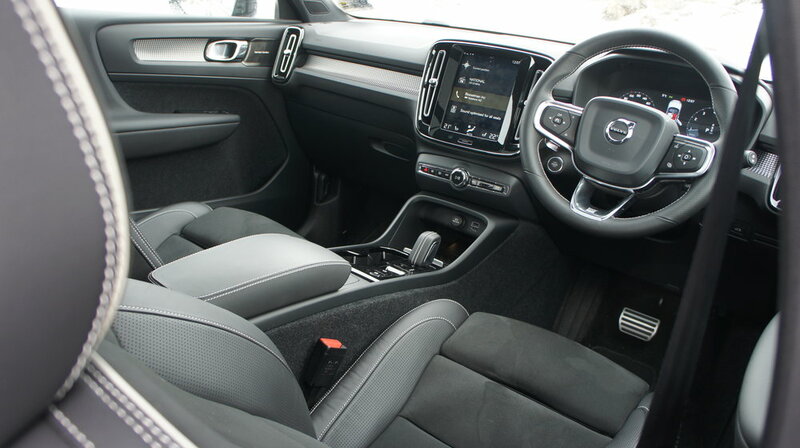 The interior carries a lot lifted from the XC60 inside, starting with the big 'Sensus' touchscreen in the centre of the dash and the digital dials. Volvo’s marketing people reckon this car stands the best chance of being the most attractive choice for Volvo first-timers and further believes quite a few of those buyers will be young. That’s why the cabin treatments are a bit louder and funkier than you see in its bigger models. The most expressive element in this car was its orange carpet, made from recycled PET soft-drink bottles and colour is called Lava. Would you have it? I’d personally have reservations simply on the basis of knowing that the carpet had become somewhat grubbier in the several months between first seeing this car (at media event in Auckland) and driving it on my local roads. Still, it’s clear a huge amount of thought and attention to detail that has gone into the interior. This is the fourth new Volvo I’ve driven with the Sensus infotainment system and I’m pretty well on top of how it works now. I can understand why newbies need some time with it; but, honestly, perseverance pays off. Apart from being beautifully big, it looks genuinely top class, like an inbuilt Apple iPad. The only downside is that as a touchscreen it can end up looking a little grubby with fingerprints after a lot of use. So carry a soft cloth. If you’re into Swedish design you’re going to be fascinated by some of the detail touches here. Huge – as in, big enough to not just to swallow a 15-inch laptop and a big bottle of water but also force the stereo speakers to move higher up on the door (backed up by a 'woofer' speaker on top of the dash) – door pockets, a space in front of the gear shifter for an iPad which also holds the phone charging pad, a lidded rubbish bin in the centre console designed for a box of tissues … it’s clearly a cabin for a modern age. How do people fit in? Actually, we’re okay. It’s a compact car, so the front seats are better for adults – not just for roominess but also comfort - than the back bench, which realistically doesn’t provide enough width for three big bodies (or three booster seats). The boot’s 460 litres’ capacity is exactly on the class average, though Volvo has maximised practicality with a moving, flipping, floor that allows you to section off separate areas of the boot, plus more than a few hooks to hang stuff off. So it’s posh and it’s reasonably practical. Does it drive well, too? The engine and transmission are fine. Plenty of grunt, good shift quality. In T5 form it's certainly fast (0-100kmh in 6.5sec) and the powertrain feels fizzy indeed. But engaging? Well, it is that too, though not without flaw. Unlike other XC40 models, the R-Design gets the 'Sport Chassis' treatment, bringing with it stiffer springs and tuned dampers. Even though this undoubtedly contributes to sharp handing, I’m not a fan; it’s too brittle on our coarse chip. Then again, the less dynamic setting wasn’t quite in tune with some winding country roads, either. Also, the steering is rather devoid of feel. But it does have plenty of grip and traction. We did manage to find some snow in which to play, and it didn’t let us down, romping around like a big Saint Bernard dog. At the same token, you wouldn’t want to take an R-Design on a proper alpine expedition; there are too many shiny bits. Just like the larger models in its range, the XC40 isn't lacking in safety systems. All versions come with City Safety as standard, which can detect cyclists, pedestrians and large animals, alerting the driver and braking. There's also road sign recognition, so you always know the speed limit you're driving in, and a lane keeping aid. The Pilot Assist is an advanced form of adaptive cruise control, which can assist (but not entirely take over) driving on roads with clear markings. So, motorway driving gets a bit more relaxing while the car keeps itself in the centre of its lane. Blind-spot warning, collision warning, lane-keep, "mitigation" aids for everything from oncoming traffic to running off the road, whiplash protection and tyre pressure monitoring also feature. Bear all that in mind and it is less a small car with a high price and a particularly highly-provisioned chic compact carryall. 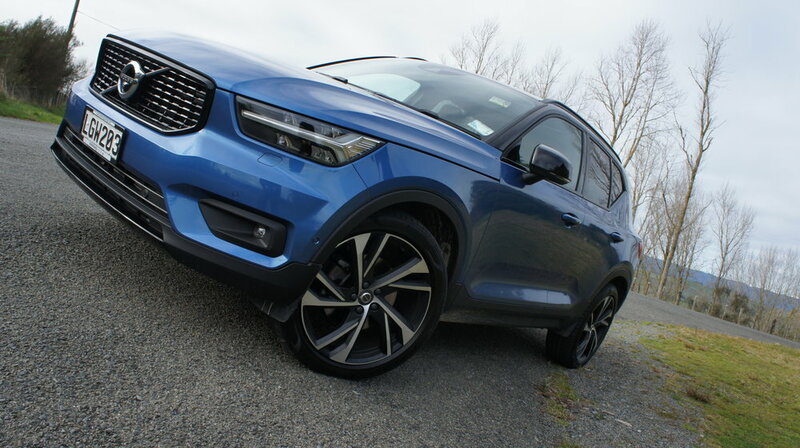 Even so, you really cannot avoid noticing that the money asked for the flagship XC40 would also buy some tasty larger alternates, including versions of its XC60 big brother.